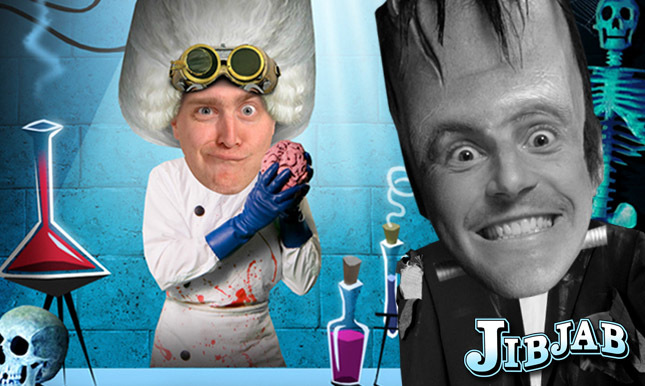 Here is a sneak peek at two of the five characters for our big Halloween video debuting next week! We’re taking Starring You to new levels of diabolical personalization, allowing you to affix your head in our symbol technology. What does that mean? Facial hair, giant goggles and monstrous features are going to blend right into your head! We’re also releasing the brand new ability to tint your head’s hue and make it any color in the rainbow. Green, purple, orange, you name it! This is the closest you can get to turning into a monster without being cursed, bitten or raised from the dead! This entry was written by paulhanges and posted on September 30, 2009 at 7:05 pm and filed under Monster Mash, New Content, Sneak Peeks. Bookmark the permalink. Follow any comments here with the RSS feed for this post. Trackbacks are closed, but you can post a comment.